we have your correct email/contact information. Wondering how the digital magazine work? Lisa explains it on this program. Why is this digital now? 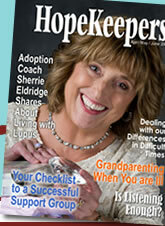 HopeKeepers® Magazine offers spiritual support to those who live with a chronic condition. What is the definition of a chronic illness? Anything that causes continuous pain or an incurable illness. This can include fibromyalgia, diabetes or heart disease, chronic fatigue syndrome, migraines, back pain. "There are many health magazines," says Lisa Copen, 40, founder and Editor-in-Chief of HopeKeepers, "but for those who may live decades with a chronic illness there are few resources that address the rollercoaster of emotions and practicalities of effectively living with disease-especially from a Christian perspective, which is the foundation for many.Coping with chronic illness can be disheartening, through support with others we can learn how to manage chronic illness well." Subtitled "joyfully serving the chronically ill," HopeKeepers is Christian in nature, and addresses diverse topics such as spiritual struggles, family challenges, alternative medicine, devotionals, caregiving, doctor's advice, and profiles of celebrities and national HopeKeepers groups. HopeKeepers® ISSN # 1547-6669, is a quarterly publication of Rest Ministries, Inc. P.O. Box 502928, San Diego, CA 92150. You can subscribe either on the internet or send a check to the address above payable to Rest Ministries, for $17.97. Rest Ministries is an 501[c](3) nonprofit international organization that serves people who live with chronic illness or pain by providing spiritual, emotional, relational and practical support; they equip churches to minister to and with the chronically ill.
CHECKS PAYABLE: To REST MINISTRIES, thanks! Any material in this publication may not be reprinted without written permision from the editorial office. HopeKeepers is a Registered Trademark of Rest Ministries.